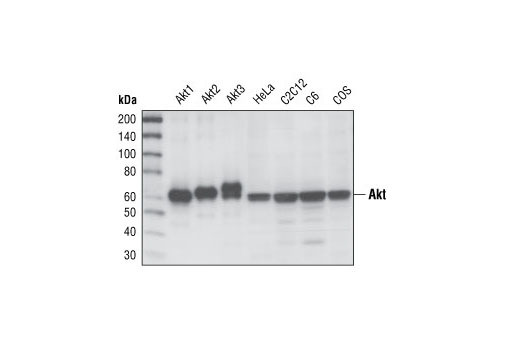 Western blot analysis of recombinant Akt1, Akt2 and Akt3 proteins, and extracts from HeLa, C2C12, C6 and COS cells, using Akt (pan) (11E7) Rabbit mAb. 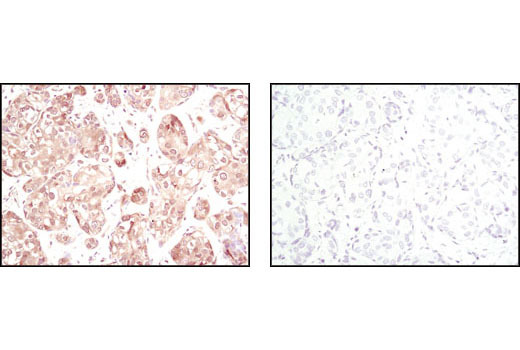 Immunohistochemical analysis of paraffin-embedded human breast carcinoma using Akt (pan) (11E7) Rabbit mAb in the presence of control peptide (left) or Akt (pan) (11E7) Blocking Peptide #1085 (right). 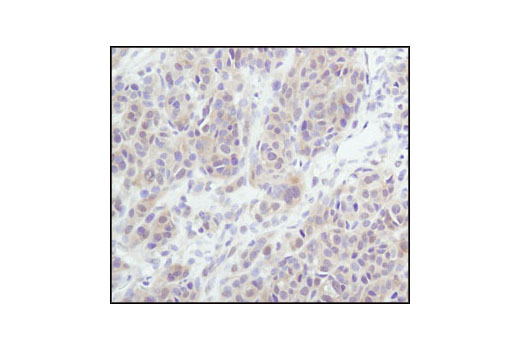 Immunohistochemical analysis of paraffin-embedded human lung carcinoma, using Akt (pan) (11E7) Rabbit mAb. 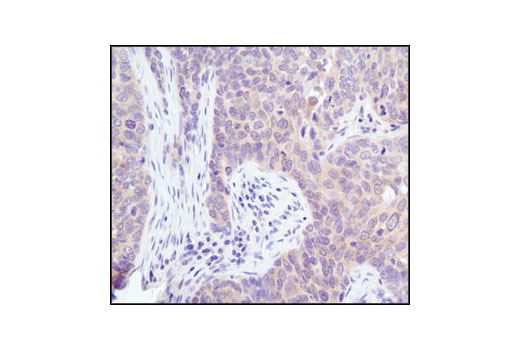 Immunohistochemical analysis of paraffin-embedded human melanoma, using Akt (11E7) Rabbit mAb. 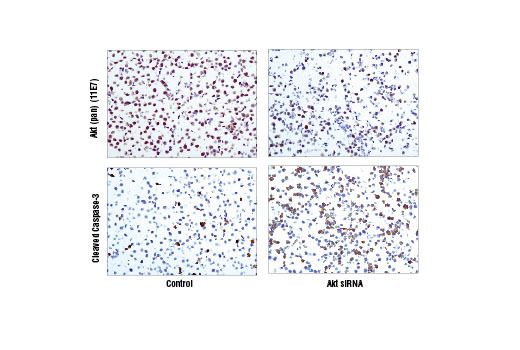 Immunohistochemical analysis using Akt (pan) (11E7) Rabbit mAb on SignalSlide(TM) Phospho-Akt (Ser473) IHC Controls #8101 (paraffin-embedded LNCaP cells, untreated (left) or LY294002-treated (right)). Note the lack of phosphorylated Akt-associated stain at the membrane of the LY294002 treated cells. 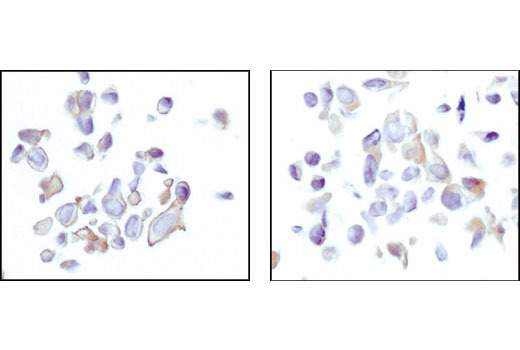 Immunohistochemical analysis of paraffin-embedded HeLa cells untreated (left) or transfected with Akt 1/2/3 Kinases ShortCut® siRNA Mix (New England BioLabs #N2005) (right), using Akt (pan) (11E7) Rabbit mAb (top) or Cleaved Caspase-3 (Asp175) #9661 (bottom). Note the induction of cleaved caspase-3 in Akt deficient cells. 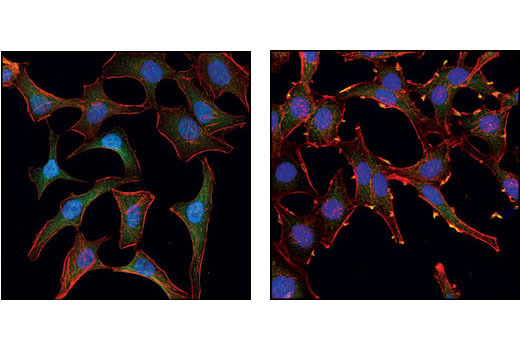 Confocal immunofluorescent analysis of HeLa cells, serum-starved (left) or insulin-treated (right), using Akt (pan) (11E7) Rabbit mAb (green). Blue pseudocolor = DRAQ5® #4084 (fluorescent DNA dye). Flow cytometric analysis of untreated Jurkat cells, using Akt (pan) (11E7) Rabbit mAb (blue) compared to a nonspecific negative control antibody (red). 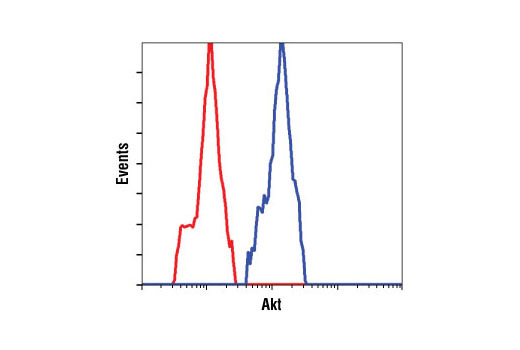 Akt (pan) (11E7) Rabbit mAb detects endogenous levels of total Akt protein. This antibody does not cross-react with other related proteins. Monoclonal antibody is produced by immunizing animals with a synthetic peptide at the carboxy-terminal sequence of mouse Akt. Devi, L. and Ohno, M. (2015) Transl Psychiatry 5, e562.